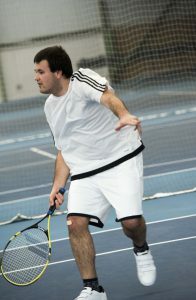 Jack, aged 25, who has been visually impaired from birth, travels to the Nottingham Tennis Centre once a week to play Visually Impaired Tennis and train for the Regional and National tournaments he competes in around the Country. The Friday evening sessions he attends (6pm – 7pm) are open to all ages and abilities, with the youngest player being just 10 years old. You don’t have to be a member to play and there isn’t lots of expensive equipment needed either, as the sport uses standard rackets and a simple foam “audible” ball, which has a bell to help with ball location. In many ways the game is the same as the national game played by the likes of Andy Murray and Novak Djokovic it’s just played on a Junior Orange court, with a lower net. Jack and his fellow players are allowed from 1 to 3 bounces of the ball, depending on t heir visual impairment, of which there are 5 categories: B1 (blind) through to B5 (almost fully sighted). Jack’s in the B3 Classification, so gets two bounces of the ball. Jack was 4 years old when he started playing tennis after his Dad searched for a sport that they could play together and he’s really keen to create a legacy and encourage others to try it out, at least once. He’s so keen he even offers to mentor anyone who’s nervous about doing something new and offers to meet them at the Tennis Centre, to welcome them and put them at ease. For the last 5 years Jack has regularly travelled to play both singles and doubles matches competitively in tournaments at Loughborough, Birmingham, Newcastle and London and his best achievement has been reaching the quarter finals recently, but he claims it’s not about winning, it’s about taking part and being active. 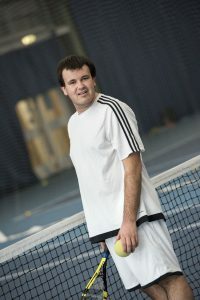 Outside of tennis and studying for his PHD at Derby University, Jack also loves walking and enjoys playing chess, something he modestly admits to being fairly good at and was once in the top 7000 in the world. 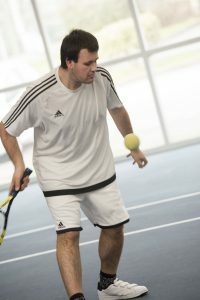 Visually Impaired Tennis is just one of our specialist sessions. Visit our Disability Activities page for other activities you can take part in.